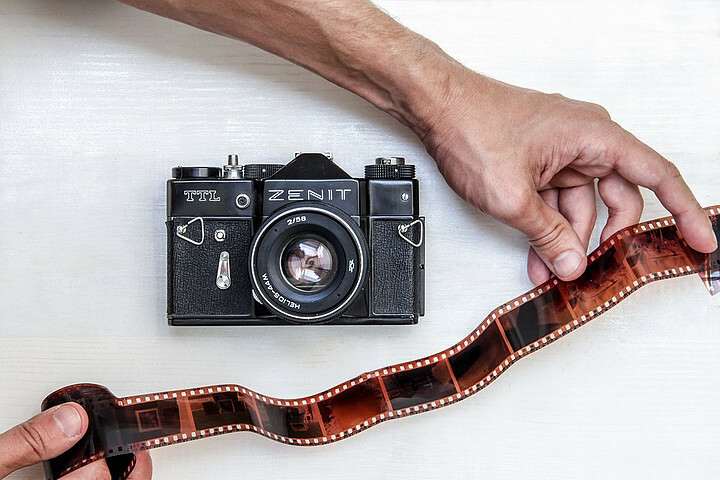 Film photography is definitely coming back and many photographers are now stepping away from digital to reconnect with the origins of this art. On top of a strong community support, we have seen recently that Kodak decided to bring back Ektachrome to the market. The overwhelming reception by the public shows us the film still has many glorious years ahead! With this renewed popularity, you see lots of young photographers (myself included) who have never loaded a film before. If you were born in the late 80’s or early 90’s, you have probably seen and used these cameras when you were young but most of you never really owned one and have no idea about what it implies to shoot film…Like I was a few months ago! When this project began, 6 months ago, I knew that it wouldn’t be easy but didn’t realize nor anticipate all this implied. Before you get started there are a couple of things that you should be aware of. I’ve come up with a list of all the points that you should take into consideration before starting, so let’s get started! Feel The Pleasure And Enjoy! 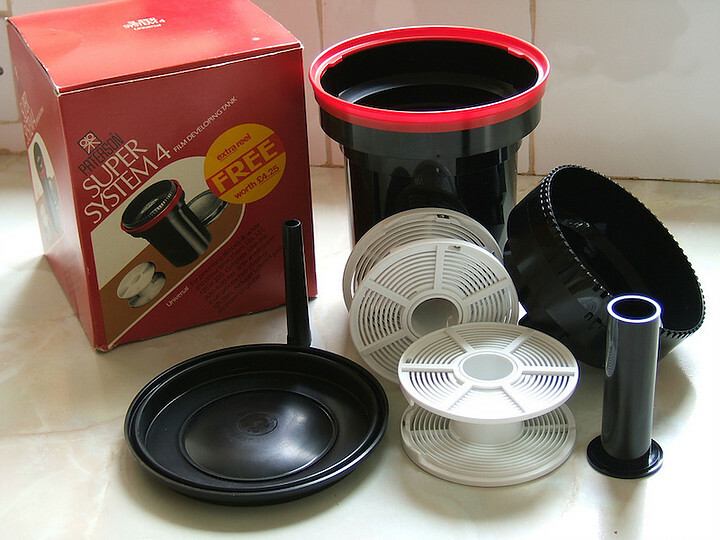 The second-hand market for film cameras is like an endless well. Today we can afford cameras that our parents couldn’t even dream of a few years ago. I’m talking here about medium format camera. If you are following my blog you probably know that my first pictures shot of film came from one of these cameras. The quality and depth of field that I was able to obtain with this gear got me hooked at the first glance. I know that it might not be the easiest type of camera to start with and I am sure that some people will suggest a 35mm camera instead, which in a sense is true. I believe that the first impression is the most important and if you are not blown away with your first pictures, you will probably loose interest in your recently acquired camera and will go back catching dust quicker than it deserves. Don’t get me wrong here, I’m not saying that 35mm cameras are not capable of taking good pictures, but the medium format has a WOW factor that can’t easily be replicated with a smaller sized film. Another point about gear is that you should resist as must as you can to the Gear Acquisition Syndrom (aka G.A.S.). Over the past months, I have bought way too many cameras and I have now very expensive and legendary cameras unused since I recently felt in love with the Hasselblad Xpan. This is for me the ultimate film camera and if I had to keep only one, it would be this one without a doubt. You don’t have to go crazy with your first camera. For less than 100$ you can get a very capable body and lens to start with. What matters the most here is the lens, nothing else. My suggestion here is to go for a fixed lens and avoid zoom at all costs. Then try to stick with it for as long as you can. You can even get a camera with a non-removable lens like this you won’t be tempted to buy another one. A very popular one among beginners is the Canonet 40mm lens f/2.8. Choosing the right film for the right situation will be the most important thing to determine here. What you have to think is that, once the film is loaded there is no way to change the ISO or swap mid roll (except for some medium format cameras that allow changing the film back). The key is to anticipate the scene that you will be shooting and bring the right film along. For example, if you are going to shoot on a bright day, there is no need to bring a film faster than 400 ISO. On the other end, if you are going to shoot at night, a 100 ISO film won’t help much. Instead, you will need to something around 800 ISO. Determining the film speed is not the only element to take into account. There are three main families of films that are still on the market. Let’s see who they are and how you should use them. A colour negative film, which means that when you look the developed film, colours are inverted, highlights and shadows as well. 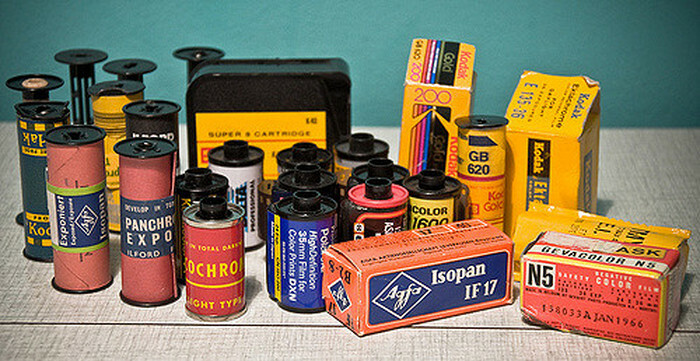 It is often called “C-41”, in reference to the developing process introduced by Kodak in the early 70’s. It is the most common and easiest to develop. You will find it almost everywhere and all the labs should be able to develop it. The dynamic range on this film is very good and it has the capability of retaining a lot of details in the highlights. Very easy to work with and highly recommended for beginners. This one is different than above because it is a positive film. It means that the film is the picture and nothing is inverted here. That’s why it was used to create diapositives. People refer to this as “Slide” or “E-6” film. Some pro labs are still developing it but it becomes more and more difficult to find and it is very expensive. The dynamic range is also very limited and not forgiving at all. Often used in landscape photography for its beautiful and vivid colours. The recently (re)announced Kodak Ektachrome is one of them. If you see the word “chrome” attached to a film’s name, chances are that an E-6 film (except for a few LomoChrome films that are instead C-41). I would not recommend slide if you are just starting as it can be difficult to handle and expensive to buy and get developed. Also a negative film, the only difference with colour negative, is that only the highlights and shadows are inverted as there is no colour. This is the ideal to start with as it is relatively inexpensive and very versatile. The only downside (which is not in the end) is that most small labs don’t develop them anymore, or if they do, it’s quite expensive. That’s why most of the photographers shooting Black and White film develop it themselves at home. It allows you so save a lot of money and also have more control over the process. There is a technique called “push” which allows you to shot a film rated at 400 ISO at 1600 ISO. Imagine you are in a concert with no other film, you’ll be able to shot it at a higher ISO and then compensate by extending the developing time. 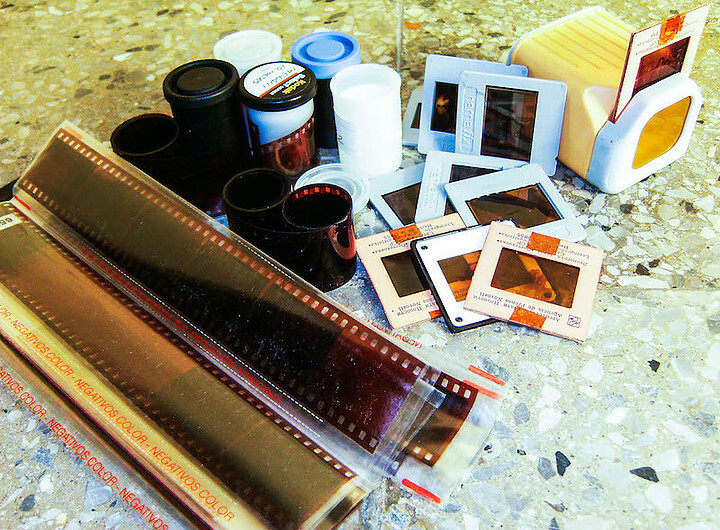 You can also “pull” a film, which is the exact opposite but not used so often. Unlike the colour negative film, this type of film doesn’t hold very well with over exposition and highlights can be easily blown out. I would highly recommend it to everyone who wants to experience with home development. If you don’t want to mess with chemicals at home but still want to shot Black and White, there is the Ilford XP2 that can be developed in C-41 like colour negative film. If you are whiling to give a bit of your time you will be able to reduce drastically the cost of your processing. The first one that comes to mind is, of course, doing your own development. It’s not as complicated as it seems to develop film in your bathroom. The process it very simple and doesn’t require much space or investment. For less than 100$ you can buy all the equipment and chemicals to start. 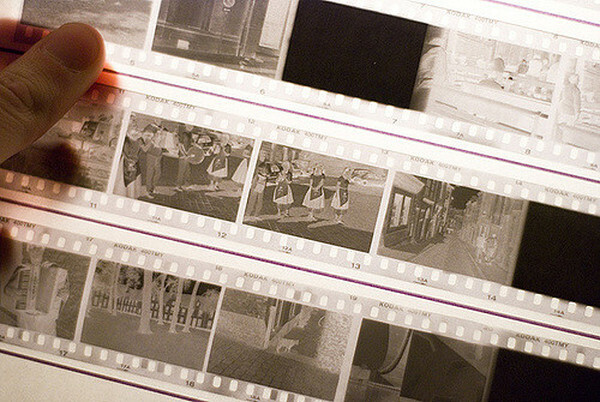 For now, I develop only Black and White because color films require equipment to maintain a constant temperature. Also, developing color film is inexpensive and I don’t feel the need at the moment to do it myself. There is also another step that you can do at home to save money in exchange for your time. To cut on the cost, I encourage everyone to invest in a scanner at the very beginning. This will save you tons of money, trust me! 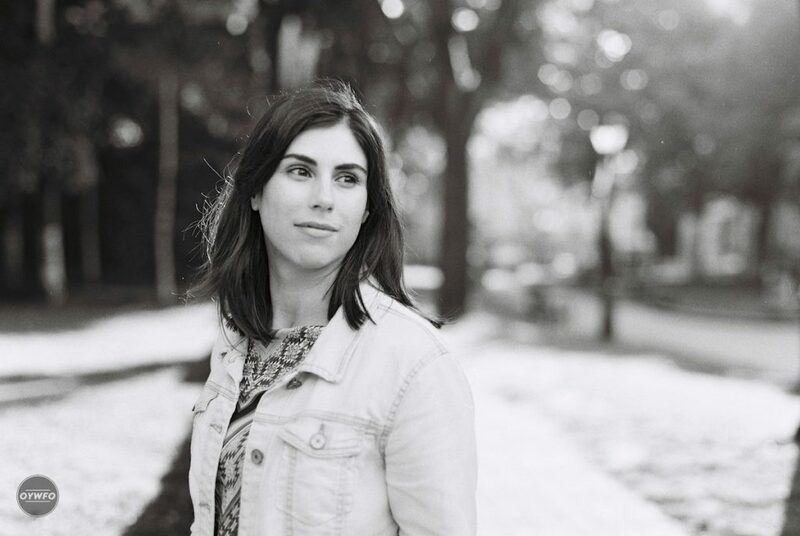 My first roll of medium format cost me 8$ to develop and 16$ to scan (1$ per picture). Add to this 8$ for the roll itself, it makes a total of 32$ for 16 pictures scanned and developed but not even printed! You can cut this price to 9$ (roll included) if you develop and scan yourself. I personally use an Epson V550 bought on Amazon for less than 200$ and it does a fantastic job! Now that we have cut the cost of processing your film by three, shooting will still be expensive and guess what? It is a good thing! It will teach when not to take a picture. When shooting with a digital camera we often use the “spray and pray” technique, hoping that we will get one good picture out of a hundred. With film, you will have to be careful with your composition, framing, light etc….That’s the best thing if you want to progress in photography. When I started with digital a few years ago, I was looking at film cameras with disdain and considering them as a pre-historic technology… Few years after, I wish someone had convinced me earlier that I was wrong. If I had started with analog earlier, I would have progressed much faster. Those past six months have been the most productive and enriching that I ever had. I have learned patience, attention to details and to take a picture only when I really feel it. There would be no point to sacrifice so much time, energy and money without any benefit! Now that you know almost everything about cameras, films and how to process them, let’s talk about pleasure. For me, the greatest reward is when I remove my film from the developing tank and look at the images revealed on the negative. Then I have to scan it and once the images appear one by one my screen it feels likes I am opening my Christmas presents! It is like seeing a kid growing up. You were thinking about your picture before it even existed, then thought about the settings, light, composition, etc… and repeated it for each frame on the roll. 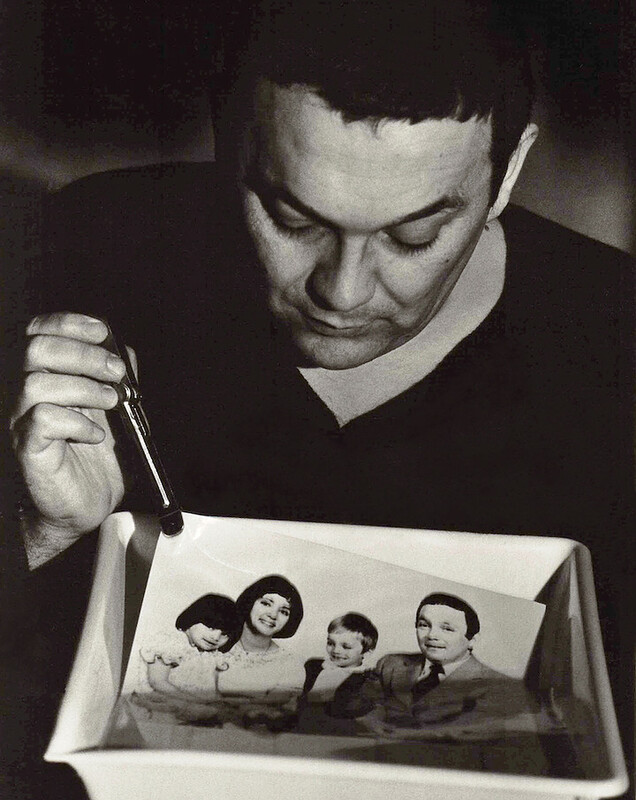 Once it was finished, you carefully rewind the film into its canister to protect it from the light. Finally, you loaded the film onto the spool in the dark, put it into the developing tank and made the magic happened with the chemicals. Being responsible for the whole process is what makes it challenging but so much rewarding at the same time! Another gratification is to hold your pictures. The mistake I did, in the beginning, was to get my pictures developed and scanned only. I was concerned about the cost of printing and wanted to save money. I am not saying that you should print all your pictures but it is important to have a physical contact with them. Try from time to time to print a selection of your favorite work. It cost only a few cents to print a picture so allow you this extra treat from to time!